These are sold by Catherine Bell (see picture at right) of The Paper Shop from Cockermouth at the cross roads in Low Lorton (on the corner leading down to Lorton Bridge) between 9.15 and 9.45 on Sunday mornings. 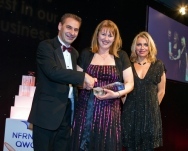 As you may know already, Catherine has won the Independent Newspaper Retailer of the Year Award run by the National Federation of Retail Newsagents and received the Award at London’s Park Plaza Riverbank Hotel on 19 October 2010. Congratulations, Catherine! See Times&Star article here and picture below.